Lillian goes to daycare four days a week. They have little cots to sleep on, but they still need a sleeping bag or nap mat on top of it so that it is more comfortable. Lillian was using an old youth size sleeping bag that was literally falling apart. Not to mention that four of her could fit in/on it! You might remember my post from about a year ago about fixing the zipper. Since then, the zipper pull broke off, as well as the stuffing becoming lumpy, but my zipper fix did hold up!! I decided that it was finally time to make a nap mat for her to take instead of the old ratty sleeping bag. I took her to Hobby Lobby with me to pick out the fabric and she of course chose purple. Yep, she loves purple just like her momma. This project is probably more expensive than it’s actually worth, but it’s fun to know that I actually made it myself. You could easily purchase one online, but what is the fun in that?!? 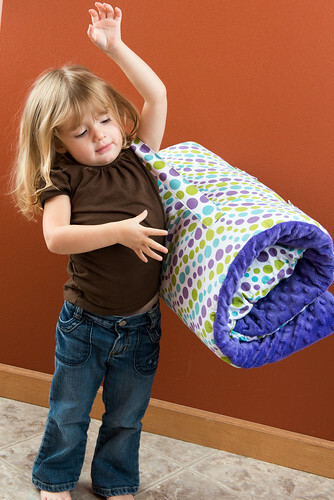 Most of the tutorials had you make the pillow using stuffing. I decided that I wanted to use a travel size pillow and add a zipper so that I could remove the pillow for easier washing. I didn’t realize that travel pillows aren’t all the same size! I got mine from Wal-Mart, so you might have to adjust your measurements according to your pillow size. Like most of the tutorials, I did decide to use minky for the blanket, but to save on the cost you could also use fleece. Then you wouldn’t need a double layer since fleece looks good on both sides. I also decided that I wanted to add zippers instead of hook and loop tape for the padding closure. I haven’t really compared the price, but the long zipper (36” to be exact) was 5 for $12 from Zipperstop, plus shipping of course. That is less than $3 a zipper, which I think is pretty reasonable for such a long zipper. So now that you know about some of the features that I added, how about the dimensions and links to the tutorials I combined in order to make the nap mat. I recommend looking over the linked tutorials or the rest of my post might not make complete sense. I wanted to describe what I did in case you want to do something similar, but since I didn’t make it into a tutorial it might be confusing. If you think you want a tutorial, let me know and I can probably make a miniature version to get tutorial pictures. I started out by looking at this tutorial and she used this tutorial, but changed a few things. I mentioned above that I added zippers instead of hook and loop tape. For the pillow section zipper I actually used an invisible zipper, but for the foam section I used a regular zipper. Here is a tutorial on how to install an invisible zipper (I will actually have an invisible zipper pillowcase tutorial soon) and here is the regular zipper tutorial. The problem with both of these tutorials is that they are more geared to sewing zippers on clothing, so they don’t show you how to sew them into the middle of a seam. But really, all you need to do is stitch over each end of the zipper. Like I mentioned above, I got the travel pillow from Wal-Mart and it is 14 x 20, but when looking online, I found some were 12 x 22 and 12 x 18. I cut my fabric to 53 x 21, and the minky (blanket part) to 36 x 36. I used a ½” seam allowance throughout. I made the blanket the same as the tutorials, except I didn’t top stitch and so far (almost 2 months of use) it hasn’t been an issue. Since the pillow was 14 inches, I made the top section 14.5 inches long, but I wish I would have only made it 14 or even 13. Since a pillow can be squished so much, I have found that it’s better to make a cover slightly smaller than the actual pillow dimensions. Anyway, I sewed my zipper on one inch from the top and made sure it was shorter than the 14.5 inches. Next, I sewed the bottom zipper on, starting about an inch from the bottom. This way, there was still room for the stitching between both sections. Remember, for both of these, you can cut your zipper to be the length that you want. 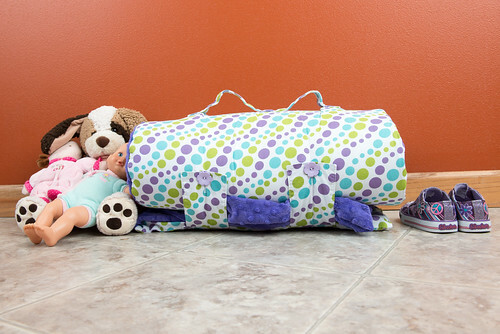 I made it so that the zipper pulls, when zipped closed, were at the top and bottom of the nap mat. My reasoning was so that they aren’t near the child’s head when they are laying on the nap mat. After installing the zippers, I made sure the foam section zipper was open, and I stitched all the way around the nap mat, with right sides facing, the blanket on the opposite edge of the zippers, and the tabs on the bottom. Then I turned the whole thing right side out and closed the zippers. I measured down 14.5 inches and drew a line. Then I stitched the line…this forms the pillowcase part of the nap mat. The nap mat is now put together completely, all that is left is to add the handle and the buttons to close it. Oh, and to cut out the foam to the correct size. You could change these depending on what you like. I chose a slightly longer handle than this tutorial because I wanted to be able to fit my arm through it when carrying it out of daycare. I didn’t need it to fit on my shoulder though. The pieces were 6 x 17, which gives a final width of 1.5 inches. To determine where the buttons (and handle for that matter) need to be placed, I rolled up the mat and marked where I wanted them to be. Nothing too scientific about the placement, other than trying it out. Lillian loves her nap mat and so far it’s holding up fantastically. Every week, we bring it home so we can wash it over the weekend. All that I have to do is unzip both sections, take out the pillow and foam, zip again, and throw it in the washer. Once it’s clean, I just put the pillow and foam back in, roll it up, and it’s ready for another week of naps. I have washed it with everything in it and it was ok then as well. Just make sure you buy the washable foam. Hopefully this wasn’t too confusing for you! It actually is a super easy project, but the size of it adds to the difficulty level slightly. Another great tute! Your daughter is just adorable! She was such a good little model for all the pictures. Is that something like extra large Minky? The dots seem so big! Also thanks for the tip on the zippers. It’s nice to know about that place for future projects. And I agree, it probably or did cost more than if you bought one yourself, but it’s great knowing that you made it for her. All the other daycare kiddos (or their parents) will be jealous!! This tutorial is actually exactly what I plan to make for my son. I have made 3 nap mats with my own attempt to combine two different patterns. The kids all love them, but the velcro was a hassle for my husband who usually waits until Monday morning to try to put everything together. I am going to try to find a long zipper for the foam part. I didn’t think about it, but the invisible zipper for the pillow is great. I love that I can wash the pillow too! Thanks again for pioneering this! Your napmat is adorable! Love the colors! I know it’s been a while,but would I be able to get a mini tutorial with pictures for this? I would love to make one like this for my son. Thanks!